Your swing is there at birth. Unseen but present. Indelible. I didn’t know it then, but that loony thought would change my life. Frank will tell you that he fired me. My story is I fired him. You know that I have been writing novels that nobody would publish for almost thirty years. Suddenly I was overnight success. A great concept will give you story beats. It supplies a villain. It provides a cast of characters. In golf, the ball sits there, staring up at you. Many brave men’s knees have buckled, confronting that gaze. In golf, player has time to think. …And we all know what happens when we have time to think. As a writer, how do I know what a character will say? My job is to find who each one is – and let that person come forward on its own. The part of our psyche that does the writing (or painting or designing or film-making) is far deeper than our personal ego. That part is tapped into a source whose wisdom far exceed our own. All we have to do is to trust it. Stories are always wiser that we are. You have not chosen the story. The story has chosen you. Writing is process of self-discovery. Writing is weird medicine. You sit down not knowing what you believe and you get up knowing. The philosophy of the authentic swing contradicts the Western ideal of education, training and evolution. It rejects the axiom that “you can be anything you want to be.” According to Bagger Vance, we can only be who we already are. The weird part about writing a book is that you think that you are crafting a story, but in fact story is crafting you. You have to be dumb to be an artist or an entrepreneur. You do. You can’t apply logic, because world of inspiration doesn’t follow that dynamic. You will be somewhere but you don’t know where. 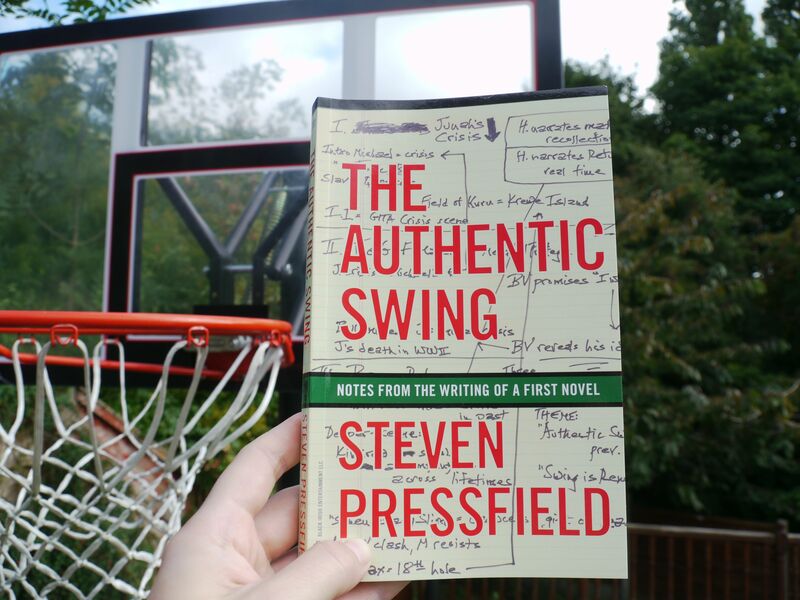 One of my “authentic swings” was basketball. After quitting playing it pro, the only sport which was able to take my breath away was golf. During summer 2008 ,I watched a movie The Legend of Bagger Vance, when my mentor Gary recommended it to me. After two years I learned that it was based on Steve’s novel, when I read The War of Art and now Steve is sending me his book… What a crazy world of synchronicities and crossing paths we live in, don’t we? Let me reveal to you one of my habits: when I read a book, I not only make tons of notes, but then I go down the rabbit hole, to read and watch what author of the book mention as his inspiration. So I create a to-do list. Here is one after reading The Authentic Swing. Golf in the Kingdom by Michael Murphy. Watch movie: Caddyshack. – done. did you experience your authentic swing yet? Which quote hit you the most? Over to you now and thank you for reading #IS (again). Keep on (re)discovering your swing and embrace unknowns on your way there. My copy is in the mail right now! These pull quotes have me so anxious!